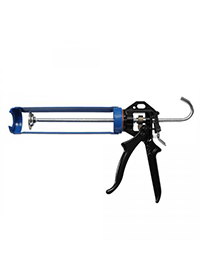 Medium duty steel frame manual applicator for single component and coaxial cartridges.Epoxy coated cast aluminium handle. Rotating epoxy coated steel frame.Cradle frame supports cartridge. With switchable PRD. Curved rod end (hook) for convenient tool storage. Designed for use with low to medium viscosity sealants and adhesives, the Powerflow Cartridge is ideal for professional and users.